Phalaenopsis Blooming Season is in Full Swing! It feels a little pervy peering in there, no? I guess Phals were discovered way before the Flying Nun TV show came out, otherwise they’d probably be known as the Flying Nun Orchid instead of the Moth Orchid. I really have no idea where this is going, so we’ll see…I kinda hope it turns into a weirdo mutant flower. That might be pretty cool. I didn’t know what color the flowers would be when I bought the plant, and I’ve been dying to find out. I’m very happy with the outcome! This type of orchid is known for its fragrance, but when I sniff the flowers I don’t really get much of a scent. There are only about six blooms open so far, so maybe when more of them open there will be a strong fragrance. There are LOTS of buds still developing and I can’t wait to see this guy in full bloom! 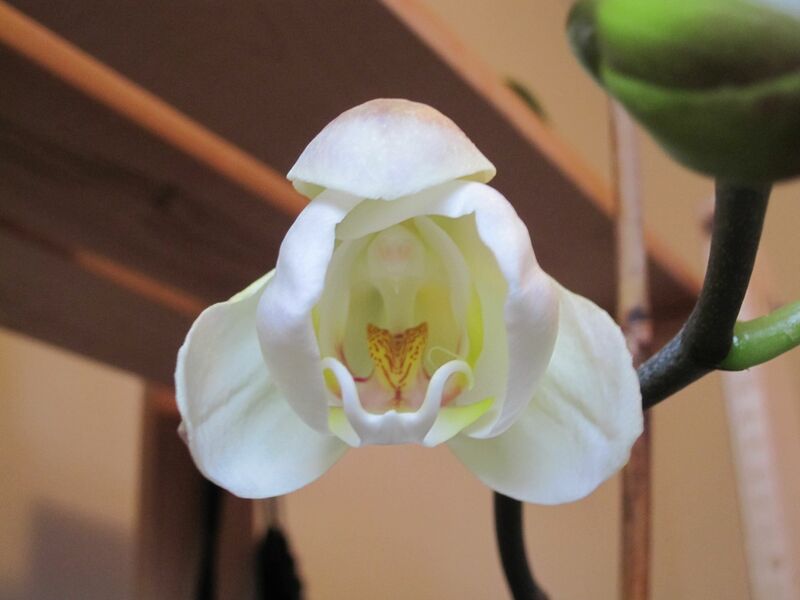 Two of my other Phals are currently in spike (one with just a single bud…but I’ll take one flower over no flowers). Because a couple of my Phals have produced short spikes with minimal buds, it’s high time I did some research on what might be causing this to happen. At least I’ve got some amazing flowers to admire in my home—and I will be making a trip to the 2013 Orchid Show soon, so stay tuned for a post about that! ← The Orchid Show 2013: Dates Announced! One orchid blog I read recently discovered that it was her cat secretly chewing on the spikes that was making buds pop out in weird places, side mini spikes, misshapen things going on almost like yours. She seriously didn’t know what it could be, bc it was happening to multiple plants and she never saw bugs or anything. Finally she caught the cat in the act! Do you have any critter friends that may be chewing on your orchids? Interesting…I actually have that orchid (as well as most of my orchids) in a room that’s blocked off with a baby gate so that Walter the cat can’t get to them. If he had access, he would chew on them for sure! Since this blobby thing is at the tip of the spike and it’s just this one plant, I feel like it may be some sort of mutation. Unless I have a secret flying mouserat nighttime visitor.